Each of these towels covers 68 popular wines and 56 different foods, for 3,808 possible pairings. 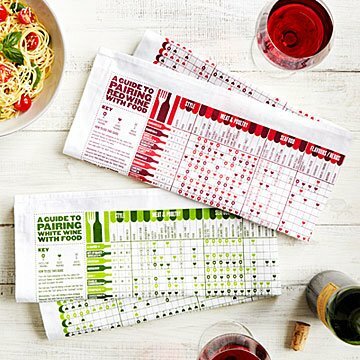 Whether you're uncorking your best vintage or just a Tuesday Night Special, select your vino's most fitting fare with these clever cotton tea towels. Featuring red and white guides, they'll please palate newbies and seasoned sippers alike. Each towel covers 68 wines, with each one rated (excellent, good, or best avoided) against 56 foods: that makes 3,808 possible pairings. You'll also find information on acidity, body, tannins, and sweetness for each wine listed. Made and printed in the UK. I thought this would be a fun and different gift for a bridal shower. It was a hit and makes for good conversation. I hope it will also prove useful or at least fun to reference at many dinner parties to come. Bought these for my dad who LOVES wine. We haven't gotten much use out of them yet but he thought they were fun. I love that they can serve a purpose while also being fun for wine drinking. Not just a piece of paper of a poster that would take up space. I am nervous to stain them though! I am getting her to use it when she cooks, but also be able to use it around the kitchen in daily life. last years gift becomes a hit again. Gave as a gift to a coworker. Very nice quality. Much larger than I thought it would be. Overall very pleased. I got this for my mom for her birthday; they are so cute and useful! We both enjoy good wine, and all the things that go with it. We've got the wine fridge, the decanters, about a million different openers, and more glasses than we need. This was that one cool wine thing we didn't even know we needed. These are well made, the print is clear, and the fabric feels sturdy. Not to mention the price on this site was way under other online stores. Gift for daughter before she visits vineyards in Napa.